KABUL, Apr 7 2012 (IPS) - Though the United States’ announcement to pull its troops from Afghanistan by 2014 was celebrated by most Afghans as the imminent end of a protracted and controversial foreign occupation, there are lingering questions about the outcome of such a withdrawal. Specifically, experts and lay people alike are asking whether it will make the country safer for democracy or more vulnerable than ever to violence and extremism. Others are sceptical that the country will ever be free of U.S. presence in a geographically strategic country, close to Iran, Pakistan and Central Asia. More than ten years since the arrival of foreign troops to ‘fight terrorism’, Afghan people are openly questioning the U.S’ ‘real goal’ when it entered the country. “The goal of the (U.S) was not to fight terrorism, even though they killed (former Al-Qaeda chief) Osama bin Laden. Al-Qaeda is still here and spreading throughout the region (into Tajikistan, Uzbekistan, etc), which is useful for the U.S. because they will be asked for help and can use it as an excuse to remain in the region,” Naseer Fayaz, a renowned journalist, told IPS. Though U.S. President Barack Obama announced the withdrawal of a portion of the stationed troops by the end of 2014, few are hopeful that this will lead to any lasting change on the ground. “They (the U.S.) will never leave Afghanistan because it is very important from geographic and strategic points of view. The U.S. strategy is a long term one, they are here to control the area from Iran to Central Asia,” Fayaz stressed. “They use Al-Qaeda to stay here, while negotiating with some jihadists to reach their goals,” he added. Wadeer Safi, a law professor in the Kabul University, believes that foreign troops will remain on Afghan soil for another reason, one that is actually relevant to the country’s civil society. “The U.S. will not leave Afghanistan before realising their goal of putting a government based on transparency and social justice into place. This is not the case up to now; criminals are still in power. They should be put on trial,” Safi told IPS. If “foreign troops leave the country in the hand of fundamentalists, Afghanistan will become a narco state linked to Pakistan,” the professor said, a speculation supported by the fact that the majority of global opium poppy – 123,000 of 195,000 hectares in 2010 – was cultivated in Afghanistan. The country also relies on the drug trade for a third of its gross domestic product (GDP). Furthermore, Afghanistan is the second most corrupt nation in the world after Somalia, making many people pessimistic about the country’s political future. Regardless of this concern, the majority of the country is in favour of a withdrawal of all troops. After the massacre in Kandahar and outrage over the Quran burnings at the U.S.-run Bagram military base, tensions swept through the country, penetrating even Kabul, where foreign troops have been replaced by the Afghan army and police. 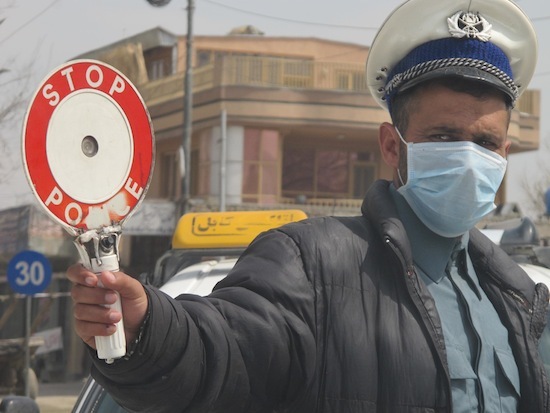 But “few people trust the Afghan police, who are divided based on ethnic groups,” said Fayaz, adding that diplomats and businessmen have turned to private, often foreign, security contractors for protection. Embassies are completely surrounded by cement walls and entry is forbidden to Afghans who do not have a special permit. The presence of warlords and their militias is a danger that could be exacerbated by the exit of foreign troops; though for now, hostilities have been suspended due to power sharing. Some experts believe that a full withdrawal will lead to the outbreak of civil war; others doggedly hold onto the view that according U.S. troops the label of ‘saviour’ is mere propaganda. “The U.S. wants to sell more weapons to the Afghans. But the origin of the Afghan problems is the occupation and the warlords in power. Only corrupt people want the troops to stay. Foreign occupations never bring democracy. The people (of a country) must struggle for freedom,” Malalai Joya, a member of the previous Loya Jirga (the Afghan parliament), told IPS. “But it is not easy to struggle against occupation,” said Baseer, chief of the shura (tribal council) of Khewa in Dar-e-Noor (the village of light), close to the city of Jalalabad. “Even if 99 percent of the people are against occupation, it is difficult to show your opposition because you will be labelled by the government as Taliban,” with all the consequences such a denouncement entails, Baseer told IPS. “We need time, we have struggled against the soviet occupation, against jihadis, the Taliban and now we are facing (another) new occupation. We are with the people and we try to solve their problems, that is why we are still here,” he stressed. He added that if a civil war breaks out, it will be the result of billions of dollars arriving in Afghanistan from outside the country “for a few rich people to build their villas”, not because of the departure of U.S. troops from Afghan soil. Kabul bears all the signs of this new ‘blood money’, where massive villas have sprung up alongside traditional mud house surrounded by open sewers, highlighting the increasing gap between a handful of wealthy people and the vast majority of the country’s poor. In any case, he added, the U.S. will not retreat completely, but simply reduce the number of their troops remaining in the military bases. During a meeting with a group of war victims held in the old city of Shari-kua and attended mostly by war widows who are asking for justice, it became clear these groups are willing to accept the presence of foreign troops “if that means peace,” said Fatma, a widow whose husband was killed by a rocket during the post 1992 civil war that shook the country. “I am worried about the last events (at the Bagram Air Base) where the U.S. soldiers burned the Quran. But if they respect our religion and they can help us, we are not against them,” she said.